Vaporous purple, whispering lavender and silken, dreamy white, the three colours of the exotic plant species Brunfelsia which gives its name to the short animation directed by Anna Constantinova pervades each pixel of the movie. This is an animated tale of two space travellers venturing into a new, enchanting and at times forbidden planet, revealing and being astonished before its secrets – a vegetative Eden hiding the remnants of a lost civilisation. Drenched in the feeling of a psychedelic carnival not solely due to its colour palette but also because of the music and the aftertaste it leaves, watching Brunfelsia is like experimenting with a hallucinogen that unleashes its effects through the magic of the screen. However, the raison d’etre of the film is that it is made to serve as a music video for the band Artefact, a post-pop outfit who are dedicated to weave inebriating soundscapes. Ethereal sonics and psychedelic visuals share a trance-inducing effect. Does the music fit this cinematic dress? Definitely. Would it be better if it was not an uninterrupted stream, hence breaking out of the label “music video” and setting the animation free? Yes. 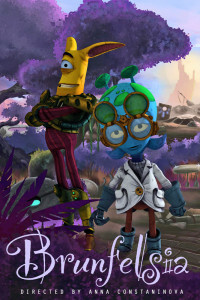 Techniques and difficulties-wise, Brunfelsia is a very good exercise in character development, which the studio passes with flying colours. A tour de force that lays bare what a dedicated team can deliver to challenge major players of the genre. A taster for bigger ventures to come, hitting the mark. The film may have narrower screening prospects due to fewer outing opportunities given to animated cinema, but it for sure will enchant the auds at every step.